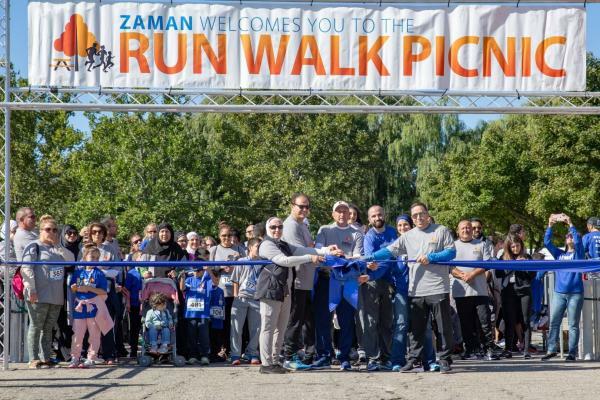 More than 900 people came to Dearborn’s Ford Field Park on Sept. 29 for Zaman’s Ninth Annual Hope for Humanity Run Walk Picnic, presented by Remax Team 2000. This record number of attendees enjoyed a day of food, fun and fitness while raising over $20,000 for Detroit-area women and children experiencing extreme poverty. The event, organized largely by the Zaman Detroit Run Team and supported generously by individual and corporate donors, featured a barbecue lunch, 5K and 10K runs, a kids’ run, and a host of activities for children and adults that included pony rides, a petting zoo, face painting, pumpkin decorating, basketball and tug-of-war challenges, and a photo booth. Ali Bazzi, event director and captain of the Zaman Detroit Run Team, said Zaman’s Run Walk Picnic is gaining ground as one of Metro Detroit’s premier fall running events. All proceeds from the event go to help low-income women with children receive essential needs and job skills training, he noted, adding that many runners love the idea of helping others while engaging in one of their favorite pastimes. The 2018 Run Walk Picnic was supported by Presenting Sponsor Remax Team 2000, Gold Sponsor Superior Buick GMC, Silver Sponsors Ally Financial, Assured Capital Funding, AXA Foundation, Butter Bear Shop, Crowded Kitchen, Detroit Medical Center (DMC), Greenland Markets, Omnex Accounting & Tax Services, RUNdetroit, Saad Wholesale Meats, The University of Michigan-Dearborn, Venture Title and Village Ford, and Picnic Sponsors Mike Dorian Ford, IHT Insurance Agency, and Pat Milliken Ford. Zaman also thanked the following organizations, businesses and individuals whose assistance, donations and supplies made the day possible: The Ann Arbor Track Club, CAVA, the Church of Jesus Christ of Latter-day Saints, Dearborn Parks & Recreation Department, The Dearborn Police Department, Dearborn Fire & Rescue, Law Offices of Ashraf al-Awamleh, Mohamad & Nadia Ayoub, Dr. Ali & Nada Najar, and the University of Michigan School of Pharmacy. Pictures from the event, as well as race results, may be found at RunWalkPicnic.org.